There are so many different CrossFit clothes you can choose that it becomes difficult to know what you actually need. First things first. You need quality on the fabrics used because this is the kind of cloth that is always in the washing machine. So, you also need it to be durable, or you’ll spend your life in the store, instead of the gym. Should you choose tighter or looser CrossFit Clothes? Mostly, you need to feel comfortable wearing your CrossFit clothes. You need to be wearing clothes that despite you’re sweating, they absorb quickly to maintain you as much fresh as you can as well as to prevent any skin irritations. For the tops, you can choose to wear short sleeve tops or tanks (or bra tops), or you can rather choose to wear long sleeves and even a hoodie. It also depends on the weather and some people prefer to wear more pieces so they can sweat more. But ultimately, and independently on the number of clothing pieces you’re wearing, you need to be able to move. After all, that’s the point in CrossFit. As for the bottoms, you can either wear shorts or pants. Again, is more a personal decision, although you shouldn’t forget about the quality of the clothes you are wearing. Women can also wear capris and tights. And if you’re just entering in the sports world, especially in CrossFit, there’s a new trend: the compression wear. These can be pants or shorts, or CrossFit T-shirts, that are elastic and adhere to your legs or chest and are specially designed for high-intensity workouts as well as to keep you fresh at the same time. Since they are making compression on certain points, they improve the circulation and decreases both inflammation and pain. But there are other accessories that you can get such as hats, headbands, wristbands and hand grips. They’re not mandatory but you can take a look at them to see if what you think. But we can’t talk about CrossFit clothes without mentioning CrossFit shoes. It’s very important that you find the right shoes for your workouts or you might suffer a severe injury. CrossFit workouts are tough and you are constantly on the move. So, you need to have shoes that give you stability but support at the same time. You need to be able to move freely so you need flexible shoes as well. Don’t forget to check if they are breathable enough. You are going to train hard and the last thing you want is to have your feet burning just after 10 minutes. Using the right CrossFit shoes will not only help you with your workouts as they will help you prevent severe injuries. 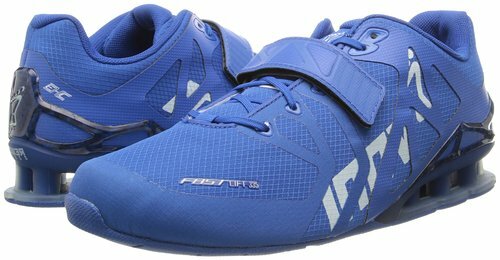 Click on the picture below to see which some of the best crossfit shoes are.